I estimated the HP and TQ numbers from the article’s graphs using a squaring ruler for the numerical chart listed below. I actually emailed the Mag, Super Rod, to see if they could feed me the raw data from the dyno pulls. I wanted to do the same thing. They repsonded and said they couldnt, all they got was the graphs. After that I was like, well then fock it. Nice of you to go the extra distance, and do it manually. Nope, read the article again. The HSR had a 58mm TB, not a 52mm TB. I can tell you this right now, a 58mm TB on the MR would make a definite difference in the max HP. They purposely sand-bagged the MR with the 52mm TB. on the way to the printer. The overall numbers seem difficult to believe. Just curious......how do you know it was done on purpose? I personally think they should have ran each of the various intakes with whatever TB was optimal for a particular intake. Clearly the stock TPI system would have performed better with a 52mm TB as well. But, after reading the article more carefully, (initially I just looked at the graphs) I think I can figure out what probably happened. Initially, they planned to use a 350 @ 10:1, AFR 180s and a fairly mild cam. But they had engine problems so they swapped to a 383 with a far more aggressive cam. I suspect they initially contacted the various companies and requested an intake for the 350 engine. TPIS probably saw the 350 specs and supplied a 52mm TB with their MR (to not kill bottom end TQ); which would be a proper sized TB IMO for that combo. But with the 383, the 52mm is a definite bottle neck on a MR. Imagine what the results of this test would have been had the HSR (or Superram) only had a 52mm TB and the MR had a 58mm TB? I also think a lot more people would call "foul" and point that out as a reason why the HSR and Superram didn't make as much HP. Instead, the intake that needed the most air got a restriction. Hell, they may as well tossed a Tornado in front of it too. No need to read it again,, I posted the correct T/B sizes in an earlier post. Just a brain fart, thanks for pointing it out - I've corrected it now. I don't think they "purposely sand-bagged the MiniRam". I think if TPiS would have sent a 58mm T/B instead of a 52mm (or sent both), then they would have probably used a 58mm on the MiniRam. If you note, the TPiS T/B was used on the TPiS stuff, the 1,000 cfm Accel T/B on the SuperRam, and the 58mm Holley T/B on the StealthRam. Anyway, you know as well as I do there is a few more HP between a 52 and 58mm T/B with the MiniRam over most of the power curve for this application. However, the main difference between the two has more to do with the runner lengths than the T/B used. edit - I started on this post before seeing your last post. I'm sure you're right about them supplying the 52mm based on the 350 combination they originally intended to use. Last edited by BadSS; 01-17-2005 at 10:05 AM. I believe Glenn hit the nail on the head. That is what happened imo. At the time of printing they should have made it more clear. They stated the fact of the engine swap but they did not go into detail about when the parts arrived for testing and why they were used specifically, just that the parts used were the parts that were sent to them. I doubt it was done on purpose. The testing seemed really objective and did not favor one company to another. Besides, the companies alone show each other up in the pricing point of view. This magazine did not have to "sand-bag" TPIS for that one. You have comprable performance for far less with Holley and you have a smaller bank account with TPIS. When Holley releases the new intake for vortec heads I am seriously considering swapping my MRIII for one. This was not an option to me three years ago. I don't think this test was as much as crowning a winner as much as about showing the differences in power curves from the different intakes. You could get a similar curve from the MR compared to the StealthRam just by using a 58mm T/B, tightening the lobe spread of the cam and reducing the duration a little. Of course you swap the StealthRam on that combination and you'll see what you see here,,, an increase in midrange that more than makes up for the drop on the top end. I'll agree that the point of the article really seemed to be to just show the different strengths/weaknesses of the individuals systems. There is no one, clear winner, because out there in Hot Rod Land, there isn't just one engine type. I don't buy the argument that a 52mm will produce better low end torque. We're talking about a dry intake manifold, so velocity isn't nearly as important as it would be in a carb setup (ie-- you dont run a Dominator 4500 on a 350). We don't have to worry about atomization. Actually, I question whether velocity is important at all in a dry intake. Frankly, I dont know, and I probably don't care. *IF* there's a difference, I'm willing to bet it is minor. Can you please add Arizona Speed & Marine siamesed runners to your graph? Sorry,,, Works will only let me do three at a time. Here is the TPiS LTR (with ported GM base), the ASM Semi-Siamesed Runners with the TPiS (Edelbrock) Base, and the SuperRam Uppers on the TPiS Base. (Based on the estimated numbers posted earlier). Last edited by BadSS; 01-17-2005 at 05:15 PM. Here is the Single Plane Holley 4bbl Intake, StealthRam, and the MiniRam. Again, based on the estimated numbers provided earlier. Last edited by Black 91 Z28; 01-17-2005 at 05:36 PM. Visit Black 91 Z28's homepage! Last edited by Black 91 Z28; 01-17-2005 at 05:37 PM. Hey bro, email me the spreadsheet you used to put together the charts. I got a couple other things I will generate from the data. I am to lazt to enter the data myself, I knows its sad, but you have already done it. I will generate average power numbers relative to powerband ranges and shift points based on common gearing scenarios. Last edited by Black 91 Z28; 01-17-2005 at 05:45 PM. I will disagree and say the Holley Stealth Ram looks like the clear winner to me. Especially when you consider price. Then it's hands down, the Holley Stealth Ram. Again, I will disagree. Velocity is an important factor. It is the reason some heads can generate so much more power than their flow numbers alone indicate. More importantly, installing a large TB on a small engine not only kills velocity, it also kills throttle response (something that is hard to measure on a dyno). But, I will say that while a 52mm TB on the MR setup did choke it some at the top-en, I doubt it made more than 5% difference in power (25HP). Not enough to make it dull the shine of the HSR. At this time, I would say that the only people how will be buying Minirams, will be people who find a good deal on a used one. I agree, I see no point in getting a miniram with HSR around for a fraction of the price. even used ones on ebay are 600-800 dollars. Just for a numbers strickly comparisson. 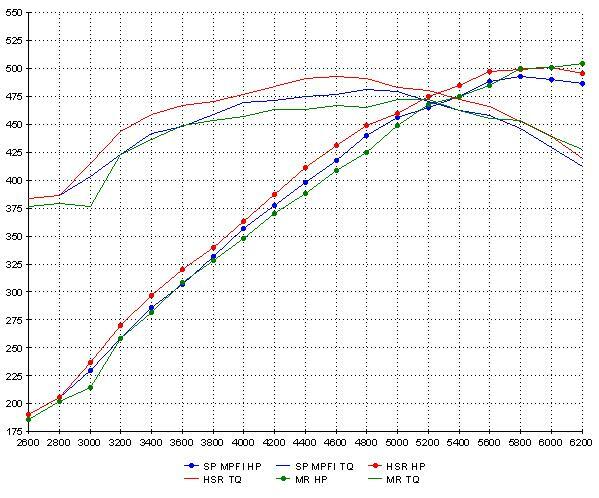 The HSR has a better average TQ and HP and more area under the curve for TQ and HP than the MR for the given RPM range. What we are seeing is only a change in technology. Nothing more. 10yrs ago the MR was the hot item in aftermarket fuel injection many would say, but now it seems to be Holley's turn, if that is what you are looking for out of an aftermarket unit. Nothing to get all hot and bothered about, just a change in times. Just think, soon the LS1/GenIII engines will be old news and everyone with a swap might be considered as fools for doing so when the next big engine rolls out to put into these cars. It is a way of life, take it for what it is. Different strokes for different folks and right now people are going with Holley(for the most part when veiwing the public opinion on this site). The one test they didn't do, that I wish they had, was test a carb on the Holley Single Plane manifold. I wonder if the early LS's and such are gonna still be getting attention 18 or so years later as TPI and SBC EFI setups do. My 82 Firebird sports a 350 TPI with the orginal 200C transmission and 2.73 rear end. No I don't race, but she runs very well. Back in 2001, I had my Firebird on the interstate at ~130MPH and it was still accelerating. The tech was reading around 4500 RPM. I now have a complete SLB exhast system with 3 inch CAT. I do not have posi, but can spin and smoke both rear wheels. I currently in process of upgrading the susupension. Just added Sphon LCAs, already have Sphon LCA-RB, Panhard Bar, and SFCs. I also have Eiback pro springs, BMR STB, and Wonder bar. The only thing left to do is add rear sway bar. All other susupension componants are new. I have the mag and really thought the Big Tube/extrude hone stock parts would be a sleeper with all that torque. My buddy said that is the way he would build a engine, all that torque. But I also think it would be hard enough to get the HSR intaked engine to hook up let alone the TPIS/extrude hone intake. What do you guys think? I'd rather get the car out of the hole and let the HP pull you away. I believe one issue with the Holley Stealth Ram most don't seem to mention is their inability to match up to aftermarket heads with bigger/larger runner ports. Most I hear of them being run with are 195cc heads. Actually, it's the reverse. TPI is tough to hookup while HSR/MR are easier. The TPI has that "big peak" and it makes the tires break loose far easier. With the HSR/MR, you TQ is flatter and thus easier to control. That is why guys with HSRs/MRs usually have higher stall converters and/or deeper gears. Somebody recently "hogged" one out to port match to an AFR 210 as I recall. If we we get "cheap tools" to reprogram the PCM like we can do with the OBD 1 systems, I think there is a very good chance. The other big problem with the Gen III series, parts are expensive (compared to the Gen 1). A better question, will the Gen 1 still be popular 20 years from now? Somehow I think the answer is YES! Just found the magazine at wal-mart. This should be a sticky since every week there is a question on 'what intake is best?'. Glen, that is what I was getting at. The HSR/MR cars should be able to get off the line easier(w/street tires) and then let the HP pull away. In a drag race the engines are only going to be at 3K for a split second. ^^Which is why I might get the Vortec version of the Stealth Ram if it ever comes out due to the fact that you get more usable power IMO. Sure the MR peaks out on top, but its not really that much of a big deal. (On this test engine anyway) Besides, I only have a 350cu and not a 383 so I think the Stealth Ram would give me more power in reality, where it is used most in the power band for driving. I misread you post. I thought you were inferring the TPI system would get out the hole better. But when I re-read it I can see that you were referring to the HSR/MR. Doug implied to me that Holley was going to fix the 1206 gasket issue on the HSR. Since the Vortec port is tall just like a 1206 gasket is. Well, I think he said he would pass it on. I bitched to him when the first HSR/vortec thread came up. Said to the effect that it was pretty sad that a TR intake needed to be welded to fit my 200cc heads. As far as port matching them to the 1206. I want to see some proof that it helps. It's a TR intake. The top of the intake is the short side of the runner coming from the plenum. I think it might just leave a big low flow area in the runner. Would hurt the low speed some I'd think. If you port match the current runner. It just leaves the injector sticking in the air flow even more. And with the increased radius on the short side. It might induce some tumble into the flow and actually reduce flow. And the runner flows 275 cfm. You need in the .600" lift range to flow that #. That's SR cam territory. The whole runner needs fixed to be an improvement IMO. I guess I'll have to see if they fixed this issue. I've never heard of Super Rod. Now I'm going to have to go and find it! To my way of thinking, trying to recall...Isn't Super Rod more a retro 50s style hot rod magazine, much like Hot Rod was in it's heyday. TPIs are a bit high tech, but I imagine being a choice some hot rodders like to consider for a retro kit style car. I know old pickups and the like often get newer motors, but wired up electronically different. If you are spending big bucks all around, vs. mild mods, it sounds more useful... after all it's no longer a 350 block in my mind. I do think opening the intake up, removing restrictive exhaust and maybe some expanded PROM tinkering can lift an old 350 TPI's spirits. I hate unplanned changes like that, if it's the case, as most people who want a practical solution (assuming of course ;:~)aren't going to over-bore their engines and add all necessary parts as well. In the interest of highest HP performance data while using a TPI system, it seems w/i reason, but someone better let them know about that find. I often just look for stories more closely related to my own requirements. The other thing is even though the Vette/F car's original TPI runners/plenum can easily be outclassed (all the aftermarket equipment evidenced), it still has one of the coolest appearances of them all, in my mind. I prefer to go the SLP/Firehawk avenue. TPIS is in Chaska, MN IIRC, not very far at all from me! Last edited by Bill Speed; 02-06-2005 at 09:30 AM. I will tend to agree with you that they SHOULD have taken each intake and optimized it to the max; tune the eprom to best it can possibly be as well as use the best throttle body and injector size as required. Also, advance or retard the cam as necessary. But, even then, comparing intakes verbatum will still not be totally fair. The optimum camshaft for a TPI and a Miniram will never be the same (given everything else the same). At some point, the cam is going to be too big for the TPI; adding nothing to HP but costing TQ. Conversely, Miniram's really like solid roller cams (based on what I've been learning from helping a buddy tune his MR setup). The solid roller with a narrow LSA added a lot of lower TQ while letting the Miniram run to stratospheric rpms, which is the MR's forte. Sticking a small hydraulic roller would kill the MR's HP but add little to bottom end TQ and may actually result in less TQ (based on our own experiences). Last edited by Grim Reaper; 02-06-2005 at 05:15 PM. They ran all the tests on Accel DFI. It's a fully adjustable system. All of the aftermarket system are real-time tunable. No 'EPROM' tuning. Err, what I really mean is all the combos likely had a 'good' tune. Maybe not 100% optimal, but probably 90%. None had the handicap of running a stock-chip on a such a modded combo. Keep in mind, it's a magazine shootout, and there is a finite amount of time available for tuning and optimization. Injector size is going to be constant. The displacement and relative camshaft size, (as it has a large effect on what the Volumetric Efficiency is goine to be), and Max RPM will pretty much define what injector size to use. At part throttle, say 2500 RPM and low-load, the engine wants X amount of fuel. Whether you have 19 lb/hr injectors or 36lb/hr injectors, the engine still wants X amount of fuel. It becomes a difference of the 19lb/hr injector having a pulsewidth that is twice as long (approx) as the 36. If you start changing the cam, it stops being an intake test. What you're asking for is an article to optimize an engine to each intake. While this might show what each intake is capable of in an ideal build, the test as run shows what most people want to know -- "I've got a 383 with a good heads & hot cam -- how much is TPI holding me back, and what are the merits of these different runner combos & intakes with such an engine?" I'm not sure there is a 'fair' way to test these intakes. (kinda wondering what you mean by 'fair') It's like taking Spud Webb and Shaq in one-on-one. They each have different strengths and weaknesses, and what's right for one situation isn't necessairly right for another. You'd need at least three different test engines with varying cam and head combos. Then test each intake on all 3 engines. Let's not even get into the issues of what works on a 305 could be totally wrong for a 406. In the end, you still can't call one intake 'the winner', unless it performs best on all three engines -- not very likely. Is it my eyes? Or did I miss something in the article??? I just wish they would have also included a converted LT1 intake manifold. Am I reading right? 1 1/2" headers? Yes, the graphs are wacky. The proper numbers are mentioned in the individual side-bars though. The article makes no mention of header size. Yea, I read wrong. The original planned combo was going to use 1.5" headers. 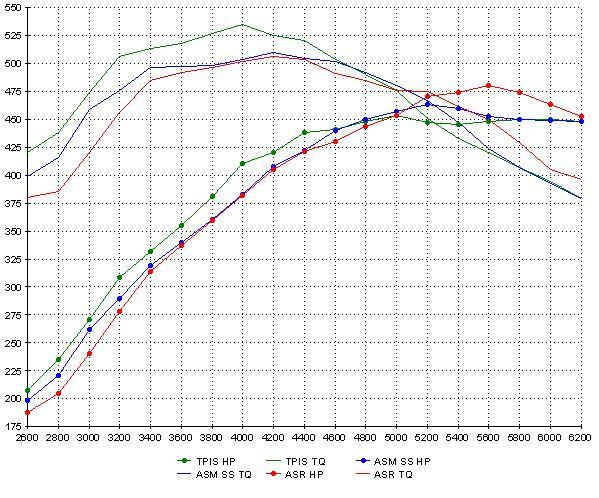 wow, tpis made more hp and torque under the curve under 4400-4600rpms!!! must be one great street car, but with a smaller cam, i wonder how the power numbers would change. maybe for the better. superram still looks great to me. nice torque curve and nice hp curve. best of both worlds, plus its emissions legal, something HSR and miniram cant say they have. Last edited by Orr89RocZ; 02-19-2005 at 10:55 PM. Hot Rod magazine did a test with a similar 383, except that they used an Edelbrock RPM Air Gap and a good carb. They pulled off 500 lb-ft and 500 hp. I know that's subjective, but I have seen comparisons between the RPM Air Gap, The Torker II single plane, and the Victor JR single plane on the same engine. The Torker II was the worst. It was better than a 70's era dual plane, so it was good technology at the time, but did not even compare to anything modern except running about the same as the regular Performer dual plane. The RPM Air Gap though, was astonishing. It outpowered everything up to about 5800 rpm, and then the Victor JR topped out a little higher in peak numbers. How this compares to the tests in this thread is that you could expect probably some of the strongest "area under the curve" with the Air Gap manifold, and it would have definitely had more average torque and power than the single plane. I find it hard to believe that it would outpower a good tuned port in the torque department though. But I dunno, it might have been comparable to the numbers seen here. I knew a good tuned port, properly matched and modified, could run with the big dogs. Maybe that'll quiet some doubters. I don't think any of the standard tpi setups would run with the HSR or superram intake even on the street. I did like the tpis modified tpi but that engine would blow the tread off the carcass. I still don't know what "HSR" means. Got a link I can cruise to and get educated? ...And quote: "I knew a good tuned port, properly matched and modified, could run with the big dogs. " ...Isn't that basically what TPIS did? Ported base and upper plenum, larger runners, larger TB. That's what I meant. Certainly not stock. Something more along the lines of what TPIS is selling.